I jerked awake to the sound of shrill cries and glanced around the camp, heart racing. Zan was on watch, his focus far behind the forsaken hilltops. Our eyes met, and his conveyed just enough: the Ghasts haven’t found us. Yet. I lay my head back on my bedroll, but only found a fitful sleep until my turn to watch. The trek through this part of the sump made the tower trip feel almost like a fond memory of what a swamp should be. The deeper we lurched through thick mud and around poisonous yellow fog, the more we realized whatever I had gotten myself into was surrounded by something far more ominous. At dusk we stopped, up ahead the outline of a broken town tempted us with the false pretense of shelter. “We have to pass through,” Zan said aloud, though he made no motion forward. Zan and Maziel both glanced at each other. Klotonk’s eyes lit up as he whipped out his notebook mumbling something about a contraption for time. “You’re right, but I’d rather not know why.” Zan responded, at last pushing forward, forcing us to follow. As we stepped into the circle of broken buildings, jagged stone roads taking the place of muck paths, the silence was overwhelming. Where once chirping insects and howling beasts filled the air, no living creature occupied this area. Only our near noiseless footfalls. In and out. That was the plan according to Zan. Through the graveyard, to the top of the hill where the tree of Obad Hai’s quest awaited. What it entailed remained to be seen. As we walked, Cosmo bounced along in perfect silence alongside us. His shadow bouncing in another direction entirely. I stopped short, Feeps slamming into me and forcing the party to a halt. “Taelim,” Maziel hissed in my direction. I was too busy watching Cosmo’s shadow run off and jump on Maziel’s shadow. The two silhouettes quarreled for a bit then returned to their owners. I looked down at my own shadow to find it in the form of a dog, chasing its tail. The group eventually caught on. “Interesting,” Klo kneeled beside his own excitedly waving shadow. “Not interesting,” Maziel immediately lifted the gnome to his feet, glancing around, hand on their hilt. “Time to move--” a raindrop splashed on her hand. Only the color looked a bit off. Another fell and then another, and it eventually began to build. I lifted my palm and caught the bizarre droplet the color of crimson. It began to pour. We didn’t argue or hesitate. Zan bolted toward the closest building, the rest of us bounding after him. We ducked inside the half-standing tavern, as deep as we dare, panting and shaking the blood off our clothes. Something clinked around the corner and we all drew weapons. Cosmo’s red head popped up over the splintered bar, emptying a coin box on the surface and sliding gold into his own purse. We sighed, backs pressed to the wall as we waited for the blood shower to stop. It didn’t last long, and at some point, water replaced blood and cleaned the streets. Still, we only stepped forward when the shower stopped entirely. “Not much farther,” Zan assured us as he glanced around the doorframe and lead the group down the streets. The town’s gate led up a winding path to the top of a hill, and from its peak we gazed out at an expansive graveyard. Far in the distance, a single tree swayed in the wind amid a maze of tombs. Not one of us wanted to enter. We didn’t have a choice as we pushed forward, bodies tense with fear and anticipation. Silently we went, listening, watching, moving on. Then Maziel lifted a single fist in the air, and we all froze, eyes turning in all directions. The drow lifted his head as if trying to hear what we didn’t. She mouthed a question, finger to his ear. None of us responded. We didn’t hear anything. Until the whispers started. The voices seemed to drift on the air, not loud by any means as they softly reached our ears, forcing the group closer together, wildly looking about. Thump. Went the first tombstone by Feeps’s feet as it fell forward into the ground. The whispers grew more excited. Another tombstone began to levitate slightly. Thump. As it, too, fell forward. Unspoken, we backed away from the falling tombs. Until Mattias fell backwards into an open grave with a cry. We scrambled to pull him up, just as Feeps slammed to the ground, a withered hand grasping his wooden leg from below. Another arm erupted from the dirt. Then another, and soon we found ourselves surrounded by moaning zombies shambling toward us. “It’s going to be loud,” I warned, drawing my scimitar and stepping closer to the party as the undead moved in. I called forward a thunderous wave of energy that slammed outward, blasting back our foes with an echoing boom. We wasted no time diving outward to take advantage of the now prone zombies. Fists flew, blades slashed out, and magic furthered the destruction we wrought to the undead that kept rising up after every attack. The battle ended in a mess of severed limbs, and us standing among the zombie parts, partly grinning. Despite our exhaustion, we sprinted toward the tree at the top of the graveyard hill. There hung a body in hides and furs, swaying from a frayed rope. I moved toward it and quickly realized this was my target. This druid had come here in an attempt to purge the blight on this swamp. He failed. Obad Hai asked no more than to grant his follower rest, but now I wanted nothing more than to see this stranger’s task through. The Standing Stones. An image seemed to appear in the back of my mind. I cut down the body, and my party helped as we found a burning slab. We spoke the rites, and I thanked the druid for his efforts, promising I would try to end this blight on the swamp and find this druidic ritual. As the ceremony drew to a close, I noticed the Geas tattooed on my arm had vanished, and with it, the weight of the deity's demands. I sighed and glanced about. Then paused, heart starting to race. “And Cosmo?” Feeps added, glancing about. “Kenderrr,” Maziel gritted their teeth. Zan buried his face in his hands, groaning. We immediately set off on a search. When your Dungeon Master asks if you want to challenge the party gods, and your character is chaotic by nature, “no” isn’t really an acceptable answer. Especially if your character’s been having a rough time. Just don’t roll a Critical 1, like I did, unless it’s followed by a Natural 20, like I also managed. Then welcome to the redemption club. “Fight! Fight! Fight!” The crowd teemed around the two combatants. We had arrived at Stiltown to the apparent shock of the bullywugs and their elder. The native orcs who largely made up the military here, and who happened to place a bet on our adventuring party, cheered our return with raucous praise. How did a small tribe show their thanks when monetary compensation wasn’t enough? With booze and food of course. “What do you mean he’ll only meet us tomorrow?” I groaned, practically tugging at Maziel’s cloak. As much as I looked forward to that night’s gathering, leaving my father to be resurrected at my convenience felt wrong. Maziel sighed and whipped around. “Taelim, for the love of...I don’t care. Please. Tomorrow morning. Bright and early. Go do Taelim stuff.” She paused. “Actually, no, not without supervision. Now, if you’ll excuse me.” The drow stormed off. To do hidden drow contact related things, dragging a semi-conscious Bargle with him. I folded my arms and turned to my friends. We overachievers did what came natural. “FIGHT!” I roared with the rest of them, sloshing my drink down my arm as I raised it upward. “Can’t even stay in school, eh boy?” Zan’s challenger sneered. Through blurred vision I could see he was a monk like Zan, or some form of it, as he positioned himself in a fighting guard. “I warned you, old man!” Zan mirrored the guard, but in a more casual manner. They lunged at each other. A flurry of blows were exchanged between the two bare-fisted brawlers. Feet flew overhead, palms punched with such force they shattered wood, even bystanders were knocked back, teeth flying. Before long, Zan’s opponent lay bruised and bleeding on the ground. Cosmo waddled to me, carrying tiny red shot glasses and offering me one. I smiled wanly, and we downed it with a clink. I had just discovered my favorite drink, and they seemed to find their way toward me and my party the entire night. Mother Maziel excluded. Having been denied nearly every possible bit of fun and freedom while in Illium, the day I left marked the start of my new life. One of reckless abandon, self-exploration, and enjoying every pleasure life afforded. I’m thankful Feeps doesn’t have a physical heart; I might have stopped it more than once in his efforts to bail me out of one trouble to the next. “And then BOOM--combustion!” Klotonk was explaining one of his recent mechanical endeavors to me, so I sat there grinning, too drunk to grasp anything. There was a pause as I reached for the flaming drink the locals dubbed: Salamander. I downed the liquid and the gnome flinched as I swayed in my seat. “It helps not to think about it right now…” I glanced around for Feeps, who was playing the fiddle much to the delight of the drunken crowd. His glimmering mantle still kept his form secret. I stumbled off my chair, claiming another Salamander as I snuck outside for fresh air. I gazed upward at the star-studded night, then quickly bent over and retched. I noticed my flaming glass had fallen over and rolled down the wooden walkway, leaving a smoking trail as it went. “TAELIM!” Maziel’s voice bellowed from inside the tavern. We faced off before I managed a lazy smile. “You’re back!” I hiccuped. The drow’s nose scrunched as she dragged me by the collar and shoved a water canteen in my hands, forcing me into a seat. “And you’re drunk. Again.” Maziel tapped their boot expectantly, and I sipped at the water, scowling. 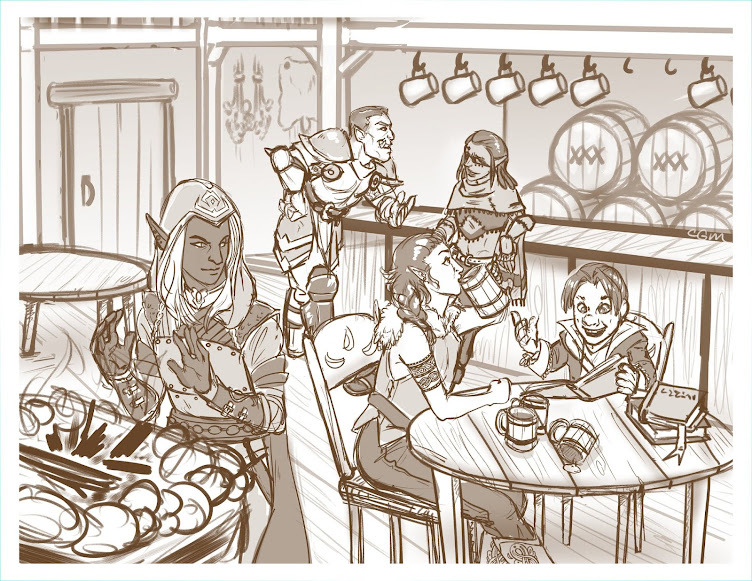 As Maziel went about corralling members of our party, shouting orders and scattering partygoers, I abruptly passed out. I awoke to the panicked scream of locals and the wafting smell of smoke. I leapt uneasily to my feet and rushed outside, and I froze in horror. The entire town was burning. Locals were busy filling pails and dumping it over the licking flames. Klotonk kept casting a frosty ray that did little more than the pails. Oh. Gods. I really did it this time. What do I do? It’s hard to describe the feeling of speaking to a god. Particularly when you don’t believe in them, and certainly don’t expect one to answer back. All I could remember was a voice warning me of a cost, and me agreeing eagerly to anything it wanted if it helped undo my mess. A druidic magic far beyond my level welled up within me. I extended my hands, eyes glowing with divine presence. The temperature suddenly dropped to frigid levels, wind whipping up around us. Rain began to beat down on my shoulders, which quickly turned to sleet. The storm doubled, then tripled in intensity, the slush quickly covering the area and smothering the flames. As fast as it had come, the sleet storm retreated, leaving behind a thin layer of ice. Huh, that’s a cool spell. I thought in a drunken stupor. The locals swarmed me, praising my actions and literally jumping for joy. Even my party stared, gaping. “You’re welcome...” I said quietly, trying my best to escape their hugs and my corrupted conscious. I returned to the half-charred tavern, thankful our rooms survived. When I reached the bed, I fell face first into the sheets and blacked out. “Where is the girl!” A voice boomed in the hallway. The bedroom door was thrown open, forcing me awake to a splitting headache. I could see my party shuffling quietly behind her, looking in. I took it, and we shook. I could feel my head nodding, but no words came out of my mouth. Just the same, she had nothing else to say. She thumped out the way she came. Maziel folded her arms, and I found myself gazing away sheepishly. Then they stopped, jaw dropping, and pulled my arm toward them. “Sweet tat,” Cosmo jumped onto the bed. I blinked at the new image on my forearm, frowning. It depicted a weeping willow surrounded by a ring of stones. “Huh, I dreamt of that last night…” I added, half hungover. “Taelim. Why would you accept that?” Feeps asked, shaking his sleek head. Because I started the fire in the first place. I wanted to answer. “Because…” was as far as I got. Zan groaned. “Of course it would be there!” He walked out to brood in the hallway. “Guess he’s in the group now?” I responded groggily, plopping back down on the bed. “Yes, mom.” I grumbled, doing as I was told. There happened to be small, forgotten stone church on the outskirts of town where the roof had long since succumbed to the elements. A thin albino man in white robes gazed upward at the exposed sky. He, however, was blind. “Pleasure,” I forced my civilities. “Then what do I do?” I felt my stomach drop, and panic began to set in. I can’t return to Illium. “You must ask,” Dmitri replied. Waving his hand with a flourish, a yellowed scroll appeared, sealed with black wax skull. “Speak with dead.” I heard Feeps whisper at my side. Dmitri cackled. He pursed his lips together, looking between different members of the group. His gaze landed on Feeps. “Quite a bond you two have,” he mused aloud. I glanced over my shoulder. Feeps was my best friend and guardian. The first to accept me truly for who I was. “The cost?” I repeated in a quieter voice. I felt my breathing intensify as Dmitri depicted the memory down to every detail, how he seemed to pick one of strongest recollections of me and my companion, and how the remembrance of that night often held me together. I opened my mouth to refute the help. “She agrees,” Feeps replied in my stead, his metallic fingers squeezing my shoulder. The Miracle Worker held out the scroll. When I reached out and took it I knew at once I had betrayed my best friend in some small way. As I stared down at the parchment in my hand, I tried to remember what I had given for it. “I bid you all a wonderful day,” Dmitri bowed his head, then hobbled out of the ruined church. The ebony spire seemed to invite us this time around. The doorway we had left from shimmered from a distance, and the key opened the way inside. For the entire trek here I had been steadily drinking the supply of liquor I brought with me. So when we approached the throne, the suffocating fear of facing my father was partly masked by intoxication. And this time, Maziel didn’t stop me. There remained the body of my father upon his throne, severed head on his lap. My constitution almost gave, but somehow I retained my liquor. I shook my head, bringing out the scroll. My hands trembled as I unfurled it and regarded the inscriptions. I could hear her move toward the throne. Then she called my name cautiously. When I turned to look, Maziel held my father’s head upright over his neck, an imitation of a full body. For a second time I nearly doubled over, but barely managed to contain myself with deep, shaking breaths. “Thanks. I think.” I held the scroll out and reread it slowly. When I thought I grasped the basics, I exhaled deeply and cast the ritual. The room seemed to grow cold, drawing in the essence of necromantic energy. The listless eyes of my father opened with a glow, his chest sucking in air greedily. I nearly lunged forward, longing to explain myself and everything that had passed between us, to ask all of the wrong questions, to ask for forgiveness. Feeps slipped his hand into mine as a gentle reminder. My father wasn’t alive. “What? But why? !” I shouted back, foregoing the fact I just blew my second question irrationally. “I imprisoned she who didn’t belong to me. This was my punishment,” the voice rasped. Wrongly imprisoned? The daughter…. I mused to myself. Feeps nudged me softly, and my brain hurried to produced another question. “Then who will take care of Illium?” I wondered aloud. “Only an heir can inherit the throne.” Was the answer, ever the reminder of my position. My hand suddenly went to my pouch and drew out the sealed scroll case. I opened my mouth to ask how to open it, and saw Maziel held up a single finger. One question left. Defeated, I placed it away quietly. With that, the light in his eyes blinked out, the air escaping his body with a rush of wind. The necromantic air disappeared, and I stood facing my father. The dead king of Illium. We buried Viceak’s body in the twilight woods where we met the old witch. That witch, as it turned out, happened to be Baba Yaga. Klotonk managed an identification on the staff she gifted him. So we returned the king’s body to where we thought he imprisoned what didn’t belong to him. Irony. The party offered their condolences, then left me and Feeps to linger in private. “I need to know what he wrote in this scroll,” I said to my warforged guardian distractedly, fumbling with the case. “Taelim. What would that accomplish?” His robotic voice chided me gently. I didn't respond for a long while, and in that time my guardian waited patiently, rocking me softly. I tried to grasp that fully. My father, the same man who often vied with me on the simplest of things, trusted me to take on a position of such prestige? What had changed in that time to make him wish that? What's more, did he really believe I could earn the title and the respect of the other Magi? The prospect felt daunting. We lingered until Maziel reappeared, signaling it was time to head out. I did have a Geas attached to my spirit after all. After that, it was on to Illium to face my past. That night as I drifted alone to my own corner of camp, I cried freely. We didn’t leave on the best of terms, my father and I. Over the years, I gradually wore him down with my ceaseless pining and endless longing to see the world around me. He continued to grow fatigued with his inability to understand me. I think he envied my bond with mother, the elven woman who hid the truth from the world to protect me. Unlike my mother, I didn’t love my father, I respected him. On my fifteenth birthday Viceak summoned me to court, and before all the lords and ladies of Illium, announced my engagement to Prince Jayce. I had spent the last two summers suffering his presence around the castle, and part of me knew this was bound to happen. He was, after all, a distant heir to Illium’s throne, and a safety net of sorts to my father. Most of all, Jayce sought to control me, striving with smug sureness to coerce me into the woman he wanted. And I hated him for it. I was no one’s pet, and certainly not his. Naturally, I refused. In front of everyone. Oh, if my father could smite me down by calling lightning then and there. Still, Viceak made it clear his word was law, and I wasn’t just his daughter. I was his subject. That very night I knew my intentions, and I knew my mother did as well. She came into my room with Feeps, bearing my father’s magic cloak, the very same that masked the warforged from recognition. She told me the truth about my true father, Elroar, whom she loved and had loved before she was forced to wed Viceak. I think she told me because she didn’t want me to make the same mistake she did, either way, my choice was clear. If I was ever found out, I’d be cast off regardless. My mother kissed me goodbye, and Feeps donned the cloak carrying me, a cat, in his arms. Luck got us out of Illium that night, luck that I managed to grasp the inklings of druidic magic I needed to start a different life. Luck that I went undiscovered and free from Illium’s burden these past four years. I stared at my father's body, disbelieving. My feet tried to shuffled forward, but I found myself on my knees, barely containing the contents of my stomach. “Brash, irresponsible, girl--” Maziel followed through the portal, with every intention to continue. Until they took in the scene. The rest of the group followed, and silence reigned. “Taelim.” It was Feeps. He shook my shoulder gently, likely as shocked and hurt, but I couldn't respond. I didn't know how. “I'll kill her!” I swore, defiant. I took deep, ragged breaths, trying to heed the drow. “We don't know what happened here,” Maziel continued, evaluating the area. That very object had been in the family for generations, it was the key to defending the city. Four colossal warforged guarded Illium at the North, South, East, and West locations, directed by the ruler and the scepter that brought them to life. With my father dead, Jayce and my aunt were the only ones left who could control them. That knowledge stung. My brain kept trying to reason nothing we could have done would have changed Viceak’s fate, and now, the fate of the city I still called home. Gods, if Illium found out I was still alive.... There’s nothing I can do. Feeps walked over to the body and took an awkward knee on his wooden legs, bowing his head low and mumbling something. I looked over my shoulder and found the rest of the party had shifted to the back of the room, affording us privacy. I grit my teeth and drew close to Viceak. Feeps took one of Viceak’s hand, watching me expectantly. I raised my own shaking hand and placed it atop of Viceak’s, trying not to draw away from the cold skin. My thumb touched the signet ring on his finger, bearing the mark of Erathis, Illium’s god of choice. “What do you wish to do, princess?” My guardian asked. “And do what?” I snapped, “Sit and pretend I own the throne? Waive this scepter around and call shots--” I lifted the scepter from my father’s lap and froze. Searing pain shot through my veins, and I dropped it, clutching my arm and uttering a string of curses. I cradled my hand to my chest, staring intently at the ground. Feeps placed something in my hand. It was my father’s signet ring, and the magical dagger he always kept at his waist. I closed my eyes and held them close. “What do you want to do?” Feeps asked, signaling the group to return. I sighed, uncertain in my convictions. “Bury him. Return him to the earth and all that I suppose. Send an anonymous note to my mother and aunt...” I threw up my hands, at a loss. Feeps lifted the scepter and tucked it away; as a product of my father, I expected as much. “Maybe send you,” I offered, half-heartedly. “They’ll need that back.” I pointed to the magic scepter. I started toward the fresco, desperate to leave this room for another day. “You missed something!” Cosmo called out waving a scroll container. My eyes narrowed, and he hurried to hand it over. “I swear, that’s all I found,” he added in a quieter voice. I took the scroll from his hand, but had no luck in opening it. It had my mother’s name written on it in Sylvan. “Irielya,” I read aloud unconsciously. Something clicked open at our feet, the broken silver collar. I rattled the spell container in my hand. “Well this thing is still sealed,” I turned it over to the gnome. “Seems like you’re not the intended. Your mother perhaps?” He handed it back to me, and I shoved the container in a pouch, determined to learn the contents regardless. “Let’s get out of here. Shall we?” I ushered them toward the painting. We agreed and returned to the library room to find Bargle missing, vines broken and scattered across the floor. The little broom was hurrying to remedy the situation. “How badly do we really need him?” Zan questioned. That seemed to bring a spring to Maziel’s step, even backtracking through frescos where horrors once awaited us. Eventually we found ourselves staring back at the spider’s portal. Hesitating. “Do you think we’ll owe another secret?” Cosmo asked aloud. “I’m all out of those,” I replied dryly, eying the drow. “Doubtful,” was all Maziel managed before they rushed through. The walls of the dark tunnels were charred black and smelled of smoke and sulfur. From deep within we heard groaning and the hissing of creatures scuttling up above, scared to draw near the flames that licked their webs. A figure in black robes crawled toward a painting of woods in twilight. Maziel was already grabbing the man, and pushed toward the newly discovered portal. The two disappeared without a trace, leaving us to stumble blindly after them. “The heir returnsss!” Voices called from above, causing me to spin on my heels. Feeps grabbed my wrist, and I was suddenly in a dim forest clearing, stunned by the eternal sunset shedding low rays of light on the deep green ground. “Please…” the man on the ground moaned. This was not Bargle, though they shared the same raven robes and medallion. This fellow was far younger, and burn marks marred his face and hands. I nodded, and muttered some of the druidic words that bore healing properties in their speech. The man in black sighed in relief as some of his burns healed to barely visible scars. Mattias nodded to us respectively. “Bargle,” Maziel repeated, looming over the prone man. Mattias nodded. “Master Bargle, myself, and two others. I thought I was the only survivor, until you asked about him.” Mattias rose to his feet and dusted off his robes. “I’m indebted to you.” He bowed low. “A life debt,” Zan whistled. The rest of us shrugged collectively. Only now did we take in our surroundings and the surreal forest dipped in a golden glow. The ranger in Maziel took over, and the drow went out ahead to scout. They disappeared behind a mossy trunk and returned with a puzzled look. “Proceed! ?” Klotonk clapped his hands excitedly. “Or she could be the witch,” I countered. “So, yes?” The gnome stared up at me. “Yeap,” I replied, easily swayed. We proceeded with caution. There, indeed, hunched an old woman on a stool, stirring a massive cauldron with a gnarled staff. A silver collar adorned her neck, evidently not by choice. She noted us without the least bit of curiosity, returning back to her brew. Behind her, a small hut was tucked away into the tall grass. Before any of us realized, Cosmo was flung back from the door, lock pick tools splayed on the ground with him. “Sorry,” the kender lied, not the least bit apologetic. Klotonk approached, cautious, yet eager to peek into the cauldron. “Hi,” he waved at the old woman who made no motion to recognize him. He stepped slowly closer while she watched him, but said nothing at all. “Do you live in this tower?” He tried politely. “So...watchya makin’?” The gnome stood beside the stool. The old woman glanced down, then gingerly stepped off, leaning heavily on her staff. The gnome practically leapt on top and leaned forward. His eyes widened, much to the woman’s subtle delight. The woman gently pushed the gnome aside and resumed her place. “What’s it for?” Klo asked, and the woman only looked up at the stars. Her eyes seemed to gleam, her stare lingered for a moment longer. She went back to stirring. “We can remove it!” Klo offered before Maziel slapped a hand over his mouth. The old woman’s eyes narrowed, for once genuinely interested in what we had to say. “At a cost,” Maziel corrected, not bothering to deny it. The drow and woman squared off in silence. Then the old woman stepped down off her stool and held out her gnarled staff. Klo seemed to grasp something in that instant, his eyes alight with desire. Klotonk repeated my mother’s name beside her, and the collar sprung open. “Ah,” the woman sighed, gratefully rubbing her neck. “My thanks.” The gnarled staff suddenly appeared in the gnome’s hands. The hut in the grass disappeared instantly, and a bizarre whistle appeared around Klotonk’s neck. She only smiled, and that was just enough for Klotonk to tuck the whistle beneath his robes. The old woman held out her silver collar and dropped into the cauldron, it sizzled and popped, melting away. With that, she inclined her head, raised a palm up and blew a hole out of the tower. A massive, gaping hole in the black stone that peered over the ugly swamp, reminding us we were hunting in a maze, surrounded by an equally dangerous environment. Her image distorted, and like a fading image, she was gone from sight. “That could have been your face, Maziel!” Cosmo gawked at the still crumbling wall, hiding a grin. “Oh shut up,” the drow turned with a swish of his black mantle toward where we came. Maziel quickly discovered a different fresco, and we could see the prison room where this all began. Chains and torture rooms had never been so appealing. We found Hissblood where we left him, unconscious in his open cell, a silver collar around his neck. I found myself removing the collar with my mother’s name, and wondering at the strange device as I placed it in my pack. The bullywug came to conscious immediately, blinking his large eyes at us in confusion. He recognized Zan, who informed him of our woodby rescue attempt. With haste, we headed back to the library door, longing for the fresh, if putrid, swamp air. Cosmo slid the key in the ornate door, and it opened to the sound of groaning hinges. We filed out, but not before the kender shouted. “Hey! No pushing!” He rubbed his shoulder, eyes darting between the door and vacant space between our group. Maziel whipped around and screamed. “BARGLE!” The drow drew her short swords and pointed forward. We quickly spotted the muddy footprints sprinting toward the swamp woods as fast as his invisible feet could take him. Like a practiced routine, Klotonk shouted a spell that revealed the man and I raised a hand, mimicking a whip-like motion. A thorny vine erupted from my reach and tangled around Bargle’s heels like a boleo, dragging him toward us. I placed it in the drow’s outstretched hands. Mattias said nothing to defend himself. Instead, the drow paused, squatting beside the disheveled Bargle. Maziel held the collar at eye level, intrigued this object might hold value. “Just slap it on him, and let’s get back to town. What other use could they possibly have?” I said, really just eager to meet Maziel’s contact and help my father before it was too late. I felt the temperature in my body rise, my muscles tensing in response. I tried to step forward, but Feeps took my hand and held me at bay. I broke free of Feeps’s hold, grabbed the collar and slammed it around Bargle’s neck. It clicked, sealed and forced the man’s eyes shut, mouth lolling open. “We ready to go?” I asked the group, for the first time on the verge of a breakdown despite my best efforts. Somewhere in the woods, Cosmo fell from a tree screaming about bees.